As one of the biggest arena rock stars of the 1970s, British guitar virtuoso Peter Frampton is still considered to be one of the most celebrated guitarists in rock history. 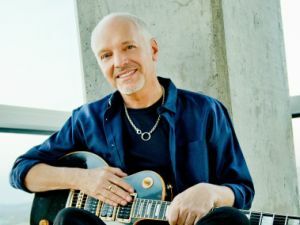 This singer, songwriter, and Grammy Award winner was previously associated with the bands Humble Pie and The Herd, and is well known for his classic hits “Show Me the Way,” “Do You Feel Like We Do,” and “Baby I Love Your Way.” This summer, Frampton is taking a collection of guitarists on tour in the Peter Frampton Guitar Circus, bringing in special guests for limited engagements throughout the tour. Joining Frampton at AMT is the Robert Cray Band. Cray is a multi-talented blues guitarist and singer, having won Grammy Awards for contemporary blues album and blues recordings. Check out the upcoming shows by Dana Carvey, ABBA The Concert, and the Happy Together Tour starring The Turtles featuring Flo & Eddie, Chuck Negron, Gary Puckett, Mark Lindsay and Gary Lewis. See our complete 2013 schedule. AMT Members can purchase tickets before the general public – Click here for more info.